Hello friends, As per fast growing technology and latest gadgets Android mobile Smartphone market is increased. But do you know that we are facing lot of disadvantage of using these Android Smartphone and the main problem which we are facing lot of is our personal and important data easily hacked by the other users. Most of the person’s want to know how to increase Android Smartphone security, after reading this article your problem will be solved. Due to the week Android smartphone security your data will be lost or hacked by the others so, use given tips to keep safe your data and improve Android Smartphone security. So, in this article I try to provide few easy and important tips and tricks from which you can keep safe your data from hackers. You also face problem different problem like lose your personal and official contacts, password of different websites on which you logged on, email id, important bank account and password when you’re Smartphone will be staling. Any hackers easily trace or track your important information from internet browsing history of your Smartphone. In that case a question is take place in your mind that is use of Android Smartphone is safe or not and how could we keep safe your important data? When we are using lot of apps you must need to give permission to access your SD card. Most of the information is leaked in your Smartphone by using these types of apps, so you must need to use security of these apps. To lock these types of apps you can use third party application. You can easily download “App Lock” facility from Google Play store. There is no need to lock all apps on your Smartphone but you can lock those apps in which you’re important and confidential data is stored just like File Manager, Gmail etc. If you lost your Smartphone by theft and there is no need to worry. If you are an Android user then you can easily track your Smartphone with the help of “Find My Phone” app from Google play store. This app takes GPS techniques to use this app to trace lost phone. With the help of this app, you can active GPS system phone of your lost phone which is on another place. It is very important and useful app. Most of the persons do not known about the advantage of this app that you can easily delete your data with the help of this app. If you lost your Smartphone, after turn on remote wipe phone this app quickly delete all your important and confidential data and nobody can trace your important information. To do this job you can install 3CX Mobile Device Manager App. The main disadvantage of using Android Operating Systems is that when you want to save any data either in your Smartphone or in your SD card you must have to give permission to access full contents of your SD card. You are not able to set permission to modify or change on any selected contents of any app in any Android operating system.You must be careful before give the permission of data access to any app due to the main reason your Smartphone data, uses of network, changes of SD card data and many more will be lost. 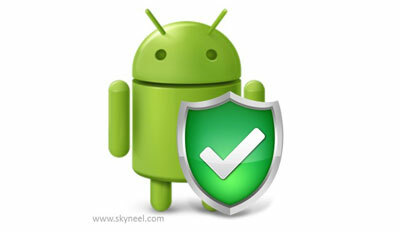 Keep safe of your network sharing is must important in your Android Smartphone. Android users must be aware that they don’t share any kind of data in public network due to the main reasons your data must be lost. So, due to overcome this kind of situation you must use “Hideninja VPN” app in your Smartphone. With the help of this app your outgoing data will be encrypted and it’s very difficult to hack this kind of data in your Smartphone. If you are using WiFi network then you have to use “WiFi Protector” app which also keep safe your data from unauthorized persons. If you are using Android tablet and want to keep safe your data from unauthorized persons then you must have to create different login accounts just like windows operating system. To do this job you have to click on “Settings” and click on the “Users” section. Every Android Smartphone users must keep or regular takes backup of his important data due to the missing of your Smartphone. You can also use “Remote Wipe” facility to easily take and keep safe of your important data backup in your Smartphone. I hope you like this increase Android Smartphone Security guide from which you will be able to easily increase Android Smartphone Security without any extra efforts. If feel any problem in this guide then please use comment box. Thanks to all.